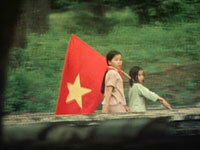 Three years after the fall of Saigon, Pilger returns to Vietnam to examine the state of the country. In 1978, three years after the fall of Saigon, John Pilger went back to Vietnam to find out what had happened under the new regime. NOTE TO ACTIVIST GROUPS: We are making this video available at a special price of $59 to activist groups. Please order under our Activists' Page. This gives you the right to show the film in public as long as no admission fee is charged. He talks with a young tour guide at a war crimes museum, who had been imprisoned in the infamous US tiger cages. He follows a former North Vietnamese soldier into the underground base where he spent 20 years crawling through tunnels undetected. He visits the street in Hanoi that was the target of the largest single aerial bombardment in history. And he shows us the re-education camps where former drug addicts, prostitutes, South Vietnam soldiers, and others are being taught what to think. And he reminds us of the long history of Vietnam's wars for independence. 44% of Vietnam's forests have been decimated, poisonous chemicals have produced babies with deformations, 58,000 Americans and 2 - 5 million Vietnamese lost their lives. And all of this suffering was for what? "To stop the spread of Chinese communism" was the rationale. And yet, Pilger argues, if we had let them form their own independent state in the late 1940s, what probably would have emerged is what is emerging now - a kind of Asian Yugoslavia. Death Of A Nation - John Pilger's horrifying exposé of the West's complicity in the twenty-year genocide in East Timor. The Quiet Mutiny - John Pilger reveals the shifting morale and open rebellion of Western troops serving in Vietnam. Year Zero: The Silent Death of Cambodia - John Pilger alerts the world to the bloody reign of Pol Pot in Cambodia. "It is almost impossible to be objective in reviewing [Do You Remember Vietnam? ], but the sheer expertise and dedication shown in its making demand the highest praise. Be prepared, prospective American buyers, for a monument to the documentary art." A 2-DVD set designed to help students critically analyze some of our foreign policy interventions since World War II.